I’m a javelin, short and stout. Here are my hooves, and here is my snout. I will eat cactus, not a trout. It’s a desert life for me, no doubt. There is an odd birdy that never could fly. I wonder why the bird cannot fly. There is a fast birdy that runs on strong legs. You can’t believe the size of its eggs. It runs on strong legs because it can’t fly. Three additional stanzas celebrate this bird’s unique features. 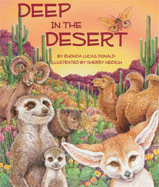 Each poem in Deep in the Desert follows a similar format to illuminate how the animals survive and function in their habitat as well as to reveal the distinctive climate and vegetation of the desert. Rhonda Lucas Donald has written an entertaining and educational book of poems. 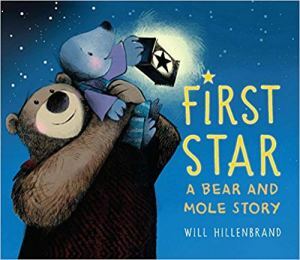 Children are exposed to the sound of poetic words, providing opportunities to practice or to teach about rhyme (slant, eye, and true), alliteration, and onomatopoeia. Repetitive phrases and familiar tunes prompt children to participate in reading and reciting after a few exposures to the poems. Donald uses a variety of sentence types—declarative, interrogative, and exclamatory. Adults should point out these marks and teach how they are read differently. Older children can learn their names and functions. Most of the songs blend well with the poetic words. Parents may want to practice briefly before beginning to get the hang of it. I was not familiar with a few of them, but tunes are not difficult to find on the Internet. 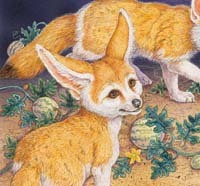 One of the best parts of Deep in the Desert is the illustrations by Sherry Neidigh. Whether it is a sweeping view of the horizon or an up close picture of small area of ground, her detail and color choices are impeccable. They are an essential element of the overall desert habitat experience. For more excellent teaching opportunities, check out the teaching guide and book’s page at the Sylvan Dell website. In honor of Poetry Friday, check out the other blogs highlighting poetic works at Book Aunt. My mom is a retired kindergarten teacher so books, especially educational ones, have always been a big part of my life. My father is somewhat of a naturalist, so a book like DEEP IN THE DESERT would have been very appealing in my household. What I really like about it, just at a glance, is the illustrations. They're not too childish, yet not too "field guide-ish" either. Very cute. My daughter would love this book! She loves the I'm a Little Teapot tune. My granddaughter would so love these coloful pictures.